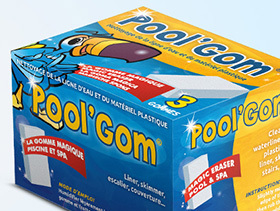 The Pool’GomXL® is made from a patented plastic sponge having the unique capacity whereby its surface hardens when humidified. Nevertheless, the hardened surface remains soft and pliable enough for easy use and scrubbing; allowing access to those hard-to-reach spots. 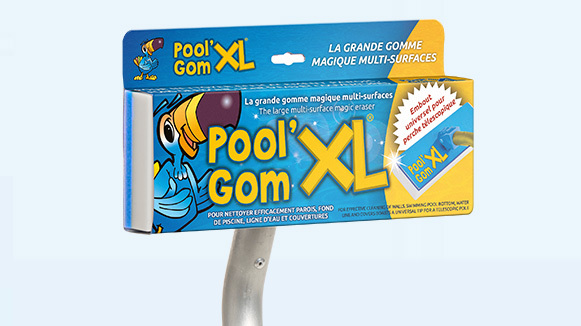 Without using detergents or chemical products, the Pool’GomXL® enables you to scrub away stubborn marks and stains … especially on the liner in the area of the waterline as well as the sides and bottom of the pool, but also on polyester coatings and tiling. 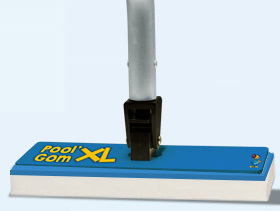 The Pool’GomXL® comes with a universal tip for use with any telescoping pole. Its 3 position settings allow you to stand while easily cleaning the bottom and the sides as well as the waterline. The aluminum bar frame ensures a greater reliability. 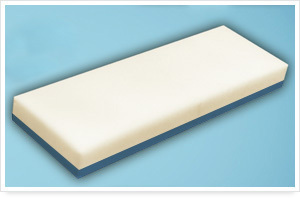 The base features a high-density PVC polyamide fiber finish. Why is the Pool’GomXL® particularly efficient? Most pools have dirt and stains (pollution, fungi, etc., etc., …) on the bottom and on the sides which are difficult to clean with your classic brushes and brooms. 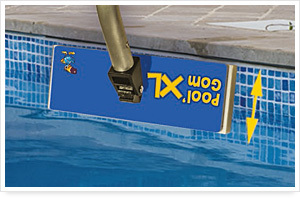 Can the Pool’GomXL® be adapted to any telescoping pole? Yes, it features a universal tip which corresponds to any handle on the market. 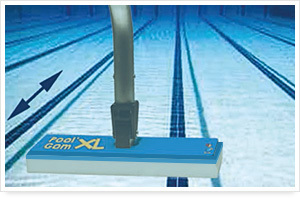 Can the Pool’GomXL® access every recess in the pool? Thanks to its astute 3 position settings, you can remain standing and easily clean the bottom, the sides and the waterline. The Pool’GomXL® can beat the most stubborn stain thanks to its increased surface enabling powerful cleaning properties. Why is the term eraser used instead of sponge? Once dampened, the Pool’GomXL® is to be used as an eraser, in other words, with a repeated back and forth motion – this movement guarantees the results. Further, the product breaks down like an eraser which explains it exceptional efficiency. How long does the Pool’GomXL® last? 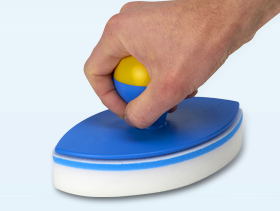 The Pool’GomXL® eraser is an expendable, rechargeable item. Its service life depends on the surface to be cleaned, its porosity (liner, tile, etc.) and the amount of dirty build-up. The base itself has been created to be exceptionally solid with a long lifespan due to its aluminum frame and high-density PVC polyester fiber finish. The extremely firm grip of the eraser demands an irreproachable reliability and solidity. 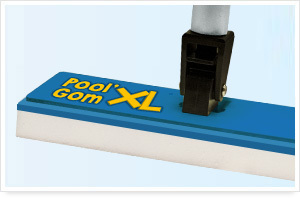 The Pool’GomXL® comes equipped with an eraser and refills are available by the unit. What surfaces can the Pool’GomXL® be used on? All surfaces: liners, tiles, polyester, shutters, pool covers, etc., … However, the Pool’GomXL® is abrasive so spot tests on a hidden area should be done first. After use, store the base and its refill in a dry, sheltered area.